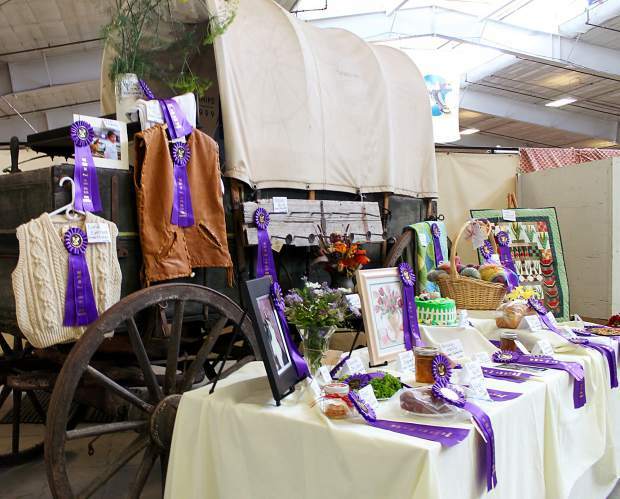 The Grand Champion display table at the Eagle County Fair & Rodeo shows the broad scope of competion offered at the annual event. The annual event returns to the Eagle County Fairgrounds July 25-28. For a complete list of Eagle County Fair & Rodeo events or to download open-class entry forms and the Contests and Open Class Handbook, visit www.eaglecountyfairandrodeo.com. For more information, contact the Colorado State University Extension Office at 970-328-8630 or glenda.wentworth@eaglecounty.us. EAGLE — Is your apple pie recipe the stuff of family legend? Are your backyard tomato vines producing a bumper crop? Did that stitching project turn out better than you expected? It’s time to show a little pride in the past year’s handiwork with the Eagle County Fair & Rodeo returning to the community on Wednesday, July 25, through Saturday, July 28. A big part of the fair fun is participation, and Eagle County’s Colorado State University Extension Office offers ways for all community members to join in the event. From handcrafted quilts and knitted items to gardening and baked goods, the open-class competition and additional contests offer something for everyone. All open-class nonperishable exhibits must be entered at the Eagle River Center between noon and 6:30 p.m. Monday, July 23. All perishable exhibits must be entered at the Eagle River Center between 7 and 8:30 a.m. Tuesday, July 24. Judging will begin at 9 a.m. Tuesday, July 24. The open-class exhibits will be open to the public from 9 a.m. to 8 p.m. Wednesday, July 25, through Saturday, July 28. Green Acre Award exhibits must be entered at the Eagle River Center between noon and 6:30 p.m. Monday, July 23. Zucchinis can be dropped off between noon and 6:30 p.m. Monday, July 23, at the Eagle River Center. Learn the importance of saving money and setting personal goals by entering the Piggy Bank Contest. Banks must be built by youth from materials such as milk cartons, soda bottles or other items of their choice. Competitors can decorate an existing piggy bank with markers, crayons, picture cutouts or fabric. Contestants can also build a bank featuring the fair animal of their choice; it does not have to be a pig. Banks must hold coins and bills and cannot be larger than 12 inches tall and 12 inches wide. Winners in each age group, 3 to 4 years, 5 to 7 years, 8 to 10 years and 11 to 13 years, will receive Grand Champion ribbons. Registration is from 9 a.m. to 4 p.m. Wednesday, July 25, at the Eagle River Center. Judging will take place from 5 to 6 p.m. that day. All babies are beautiful, but in this contest, the age 2 and younger set will complete in categories including best dressed for the fair and rodeo, looks most like Mom and Dad, best beachwear ensemble, best hairdo, Colorado sports team, prettiest smile in Eagle County and most patriotic. Many parents bring outfits for each category because contestants can enter all six categories but can only win once. Winners in each category receive a $25 Visa gift card. The contest is planned for Saturday, July 28, at the Eagle River Center. Registration begins a 9:30 a.m., and the contest gets underway at 10 a.m.